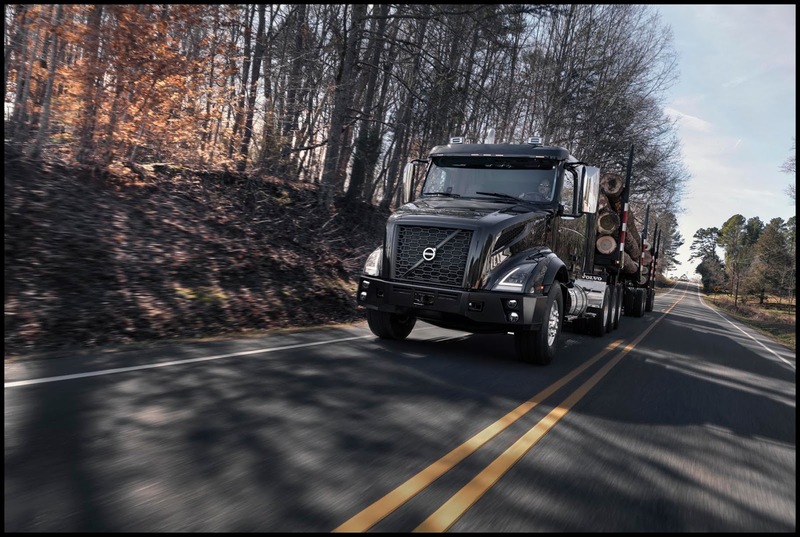 Volvo Trucks’ rugged, yet refined new VNX series is now available for order. Built specifically for the needs of heavy-haul trucking operations, the Volvo VNX series packs the power and performance needed for demanding applications such as logging, heavy equipment transport, and long combination vehicles. 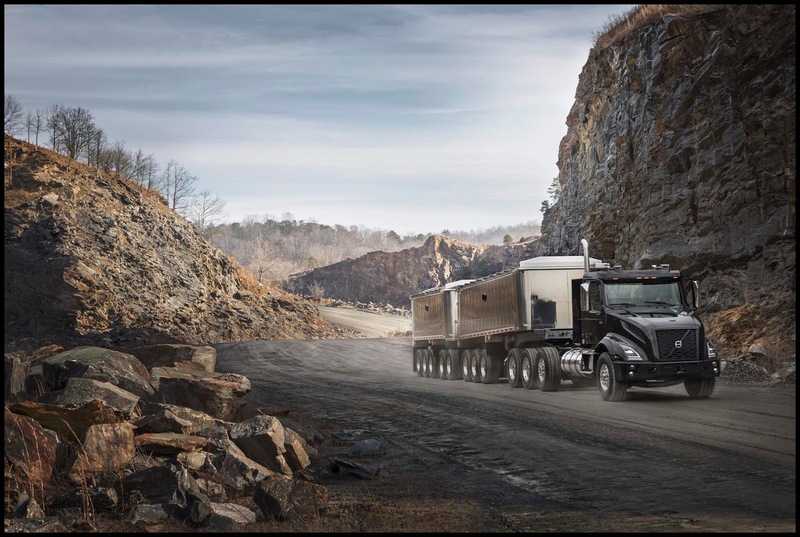 The new VNX series is the latest step in Volvo’s revitalization of its North American product range, complementing the new VNR series for regional haul and the new VNL series for long-haul operations, both introduced mid-2017. The rugged new Volvo VNX series is available in three cab configurations. The VNX 300 daycab provides muscle and maneuverability for local heavy-haul applications. The VNX 400 flat-roof regional sleeper is built for occasional overnights. The new VNX 740 features a 70-inch sleeper and all of Volvo’s latest interior enhancements, making it the perfect tool for heavy hauls over long distances. Approved Gross Combination Weight Ratings (GCWR) span from 125,000 to 160,000 pounds. Ratings of up to 225,000 pounds are available with application approval and appropriate components. Optional steer axles, lift axles, tridem drive axles, and longer fifth-wheel slides help meet a diverse range of weight distribution requirements. 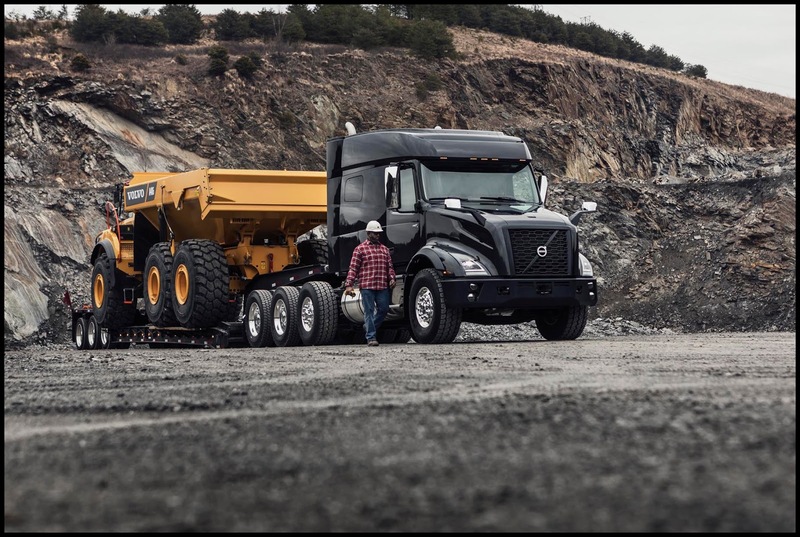 Available in 6x4 tandem, 8x4 tandem, and 8x6 tridem configurations, the Volvo VNX offers a wide range of heavy-haul components to ensure it’s properly spec’d for the job. Front axle ratings range from 16,000 to 20,000 pounds with parabolic springs. The VNX is available with up to 445 tires to match front axle load capacity. Available rear axles range from 46,000 to 55,000 pounds and the premium rear heavy-haul suspension ranges up to 52,000 pounds. Dual steering gears provide excellent maneuverability while under a heavy load. The imposing VNX provides an increased ride height to accommodate more articulation and front ramp angle, while the VNX bumper features a heavy-duty tow pin and center tow frame that equalizes forces to the chassis. 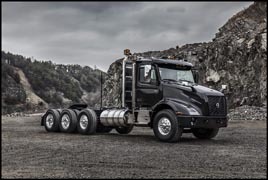 The standard powertrain package for the new Volvo VNX is a Volvo D13 engine with 500 horsepower and 1,850 lb.-ft. of torque, paired with the 13- or 14-speed Volvo I-Shift with Crawler Gears automated manual transmission. Volvo’s new VNX series is also available with up to 605 horsepower and 2,050 lb.-ft. of torque, provided by the Cummins X15 Performance Series engine and paired with an Eaton Ultra Shift Plus or manual transmission. 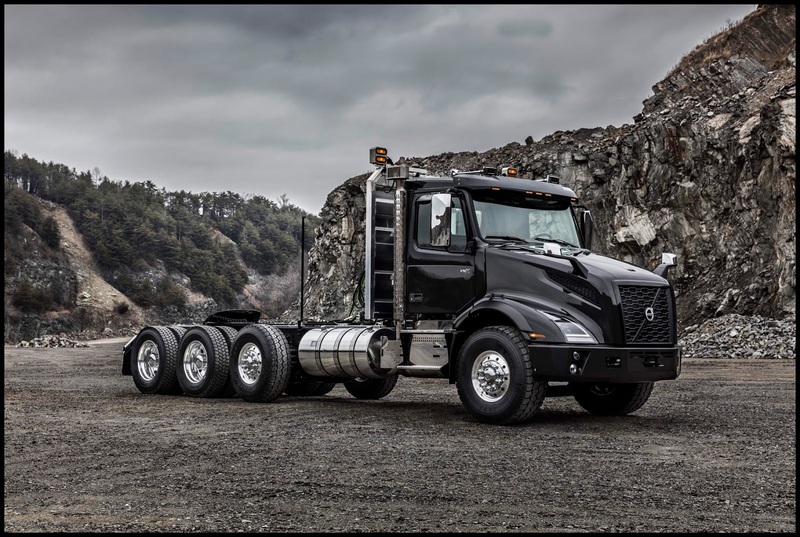 Like all Volvo models, the new VNX series cab is built with high-strength steel and exceeds both the Volvo Swedish Cab Safety Test and ECE R-29 rollover requirements. The industry’s only standard driver’s side airbag is now joined by an integrated, seat-mounted rollover airbag on the driver’s side. Volvo Enhanced Stability Technology (VEST), an electronic stability control system, is standard on all Volvo VNX models. By continually monitoring operating parameters, VEST detects imminent loss of control, jackknife, or rollover events. The system automatically reduces engine torque and selectively applies braking to help the driver keep the truck on course. The Volvo VNX series is equipped with automotive-quality LED headlights that produce abundant bright light to improve visibility. Automatic lighting and rain-sensing wipers are also available to improve safety. The dashboard on the VNX has been optimized to reduce distraction by displaying the critical information a professional driver needs at a quick glance and by grouping frequently used controls within easy reach. A configurable, five-inch color driver information display with improved graphics works with steering wheel-mounted controls providing key operating information, as well as the ability to choose your preferred diagnostic data. A dash-top tray with multiple USB and 12V connections provides a safe, convenient home for a driver’s many gadgets, which can also be linked to the optional in-dash infotainment system. Always in view, the instrument cluster’s clean, symmetrical layout and diffused, light-green backlighting makes it easy to read, reducing eyestrain and fatigue. All Volvo VNX models come standard with Volvo’s factory-installed connectivity hardware for access to Remote Diagnostics, which provides proactive diagnostics and monitoring of critical engine, transmission and aftertreatment trouble codes. The same hardware also allows customers to perform software and parameter updates over-the-air with Remote Programming, which helps improve uptime and vehicle efficiency, while reducing downtime costs. Support for Volvo trucks is provided by Volvo Action Service (VAS), a dedicated team of professionals available around the clock at Volvo’s world-class Uptime Center in Greensboro, NC. VAS agents monitor critical vehicle codes and go beyond diagnostic technology to deliver actionable solutions. If an issue is detected, VAS agents will assess the severity and provide the vehicle’s designated contact with actionable information to determine whether to keep operating the truck or take it for immediate service. All details from the service process are captured and tracked through ASIST, Volvo’s online service management and communication platform. This gives the driver, customer contact and dealer real-time visibility to case status, repair scheduling, and parts and service bay availability. Remote Programming updates are also facilitated by VAS agents.